This page is dedicated to my Adventure Activity Books series, published by the lovely Button Books in the UK and North America. At time of writing, there are four books in the series that are currently available in all good bookshops and from my shop, with book five due for release in June 2019. I’m currently working on book six - oh my! 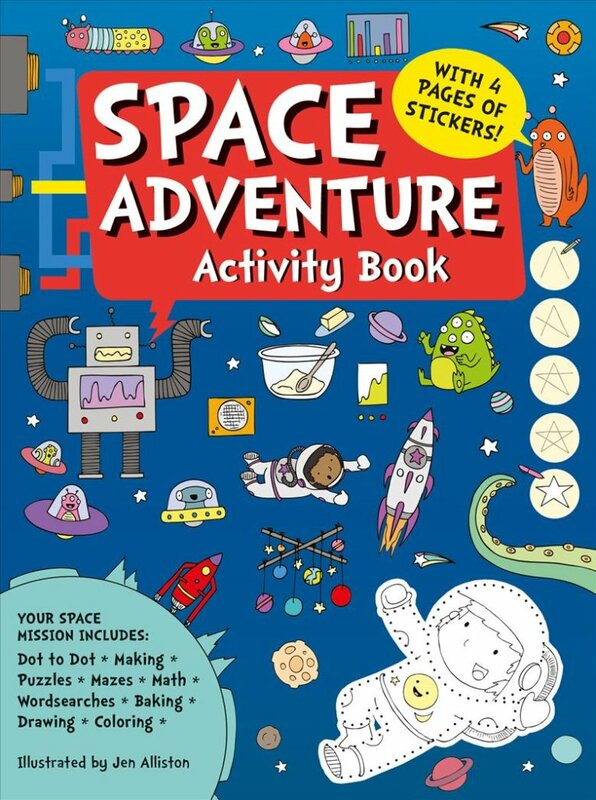 This fabulous space-themed activity book will entertain children wherever they are in the universe! The pages are crammed with all sorts of fun, including dot to dot, spot the difference, colouring in and other amusing activities. Fun and educational, Space Adventure Activity Book features beautiful, bright illustrations that will draw children in and keep them busy. And while they are enjoying the mazes, matching and counting, the games are helping them to develop a wide range of skills, including observational, conversational and motor. Perfect for children from aged 4 - 8. What do you call a sleeping dinosaur? A Dino-snore! 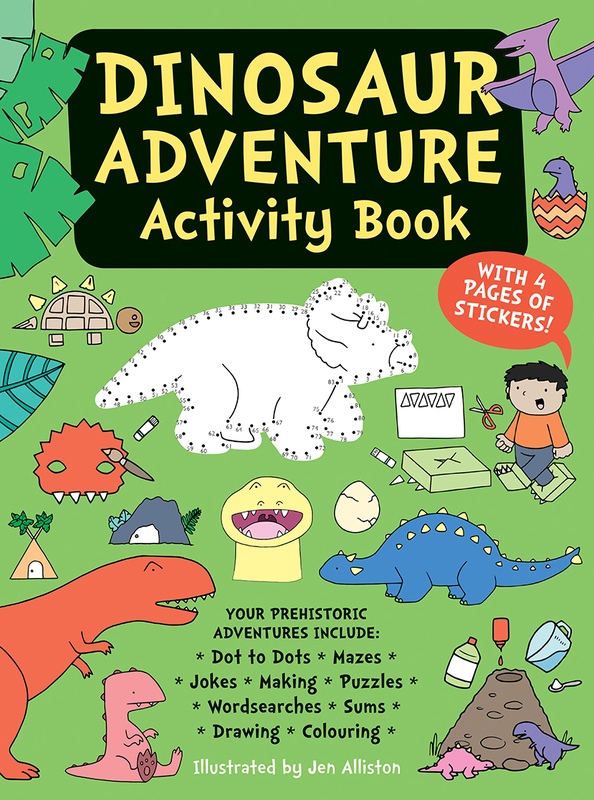 This fabulous dinosaur-themed activity book will bring hours of enjoyment to any children who are dinosaur fanatics. The pages are crammed with all sorts of fun, including dot to dot, spot the difference, colouring in and other engaging activities. Absorbing and educational, Dinosaur Adventure Activity Book features beautiful, bright illustrations that will draw children in and keep them busy. And while they are enjoying the mazes, matching and counting, the games are helping them to develop a wide range of skills, including observational, conversational and motor skills. This fabulous pirate-themed activity book will entertain children wherever they are on the high-seas! The pages are crammed with all sorts of fun, including dot to dot, spot the difference, colouring in and other activities. Fun and educational, Pirate Adventure Activity Book features beautiful, bright illustrations that will draw children in and keep them busy. And while they are enjoying the mazes, matching and counting, the games are helping them to develop a wide range of skills, including observational, conversational and motor. This brilliant Ancient Egyptian-themed activity book will keep children entertained for hours on end. The pages are crammed with all sorts of fun, including puzzles, anagrams, maths, codes, spot the difference, colouring in and other engaging activities. Absorbing and educational, the Ancient Egypt Adventure Activity Book features beautiful, bright illustrations that will draw children in and keep them busy. And while they are enjoying the mazes, matching and counting, the activities are helping them to develop a wide range of skills, including observational, conversational and motor skills. They’ll also find out more about the fascinating world of Ancient Egypt along the way.